Pundits say every season has its advantages, but I have my doubts. I like a brisk morning as much as the next person, but when I can't get the back door open because of snow drifts, and the car is buried in the driveway, again, and my usually happy indoor chive plants are looking more droopy than sprightly, it's time to say whoa! When it's cold outside -- really cold -- you probably make sure your pets, automobiles and other treasures are protected from frost, ice, sleet and snow -- oh, oh, snow! Even your precious outdoor plants are probably sleeping under a layer of mulch or snug in some other variety of temperature barrier. 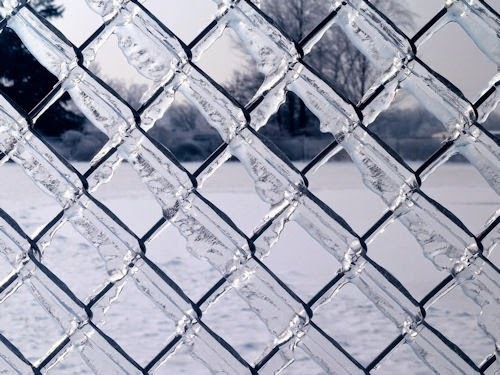 Everything may seem safe and secure until the big thaw or breakup. That would be some morning (soon, please) when a warm-ish breeze and weak sunlight will start to work their magic. While you're checking the insulating strips on your doors, and hoping that slight fogging inside your -- usually largest -- double paned window, is a trick of the light, take a few minutes to check your indoor herbs and other plants. Winter weather means higher energy bills, and if you don't have a humidifier in your home, that extra, welcome heat can also mean brutally dry conditions for plants. A little extra watering may be in order, as well as some spritzing and an emergency dish of pebbles filled with water. If your plants are stressed, and they probably are, you might see leaves with brown tips or margins. This can mean they're desperate to for humidity, to the point of releasing a little from their leaves to create their own. If their makeshift efforts at environmental management don't work, they may turn yellow or just collapse completely. When outdoor temperatures plummet, you let cold air inside every time you open an exterior door. If that air is in a collision course with one of your houseplants, it can spell disaster. When this is the case, either create a windbreak or move the plant. 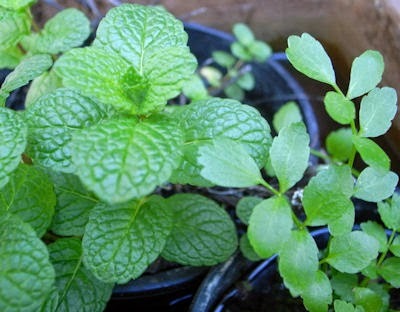 Most houseplants and many herbs require nearly tropical temperatures. A few blasts of arctic air can kill them -- and that would be a real shame. Outdoor air isn't the only problem. Plants located next to heat registers can become overheated, and even crispy, from all the circulating warmth. Move or watched them very (as in very, very) carefully. This sounds like a newbie mistake, but home builders love to put heat registers under windows, the only source of natural light in most homes without skylights. Keeping an herb plant in a sunny window usually pays dividends. The herb is nearby for easy harvesting, and keeping green growing things around is just -- nice. During weather extremes, though, close proximity to a window can be dangerous. Despite advertising to the contrary, heat and cold still seep through closed windows via the action of processes like infiltration. This makes the immediate area around them either hotter or colder than the thermostat indicates -- and sometimes remarkably so. In fact, studies conducted by regional energy companies suggest that up to 25 percent of consumer heating and cooling dollars are spent compensating for heat gain or loss from windows. The takeaway here is to make sure houseplants are far enough away from windows to be safe, but still close enough to take advantage of the light windows provide. Exposed (no trees, shrubs or other protection) and windward windows are at the greatest risk for cold penetration, and the directional orientation of the window (north, east, south and west) will play a seasonal role, too. To get a good idea of the climate you're providing your houseplants, test areas around your windows and drafts from exterior doors with an instant read thermometer. Do this at different times of day and at night. Close window drapes at night. Make sure plant leaves aren't touching windowpanes. 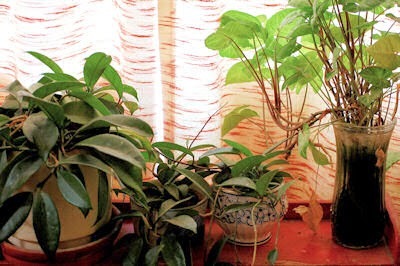 Pull plants back a few inches from cold windows. Consider adding insulation to windows (and doors). Move plants away from the coldest windows, and double up around warmer windows on a regular rotation so all pots get at least some sunlight. Consider adding grow lights to your setup, too, and reducing your reliance on windows altogether. Cover plants with clear plastic sheeting or bags for warmth during cold snaps. This is for short periods only, and works best if you can create a tent-like arrangement where the plastic isn't actually touching the plants. Add layers of newsprint to dormant plants you may be overwintering in a garage or shed if you think the temperature in that location will drop below freezing. Humidifiers are pretty inexpensive these days and can be a real boon to indoor plants. They're available as large consoles and also in tiny desktop models designed for personal (or plant) use. Make sure any model you consider has an automatic shutoff in case the water runs dry. Grouping plants works, too. Bring outliers into close proximity to one another, creating groupings of multiple plants. This helps create a microclimate where plants share resources like ambient humidity from their pots, sunlight and gentle air flow. Decorative tabletop fountains can also help contribute humidity to groups of plants. Place a fan in your bathroom to blow steam from your shower or bath out into your rooms. This can be especially effective in a small apartment. Keep shallow dishes of water on or near your heat registers. If you don't like leaving the water completely exposed to the air (and your curious and thirsty pets), add sand, marbles or small stones to the dish. This creates weight and stability, and discourages the family dogs and cats from using the dishes as second (or third or fourth) watering holes. Open the door to your dishwasher after it completes a cycle and let the steam vent into your rooms. If your dishwasher has a "dry" cycle, turn it off and air dry your dishes instead. When you're proactive about plant care, you don't have to worry about damage control later when the sun comes out.